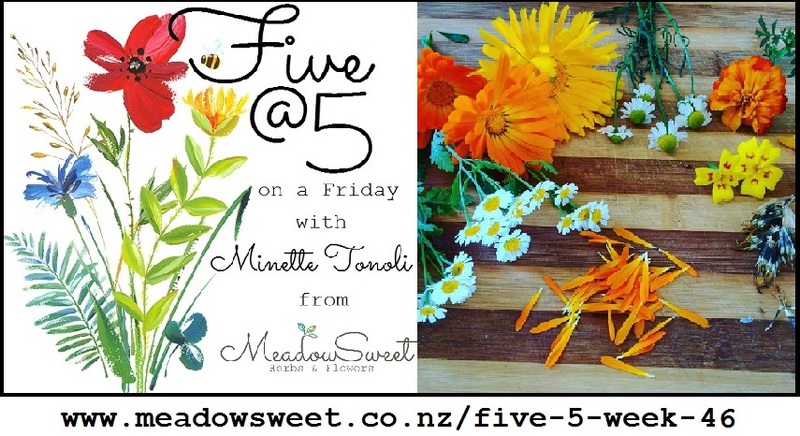 Welcome to the Week 46 edition of Five at 5. Marigolds in the garden – various species of the Tagetes genus, or common marigolds, including French & African marigolds, cygnet or starfire marigolds, Mexican or tarragon-scented marigold and passionfruit-scented marigold. Finishing off with a quick look at edible Chrysanthemum (Glebionis coronaria syn. 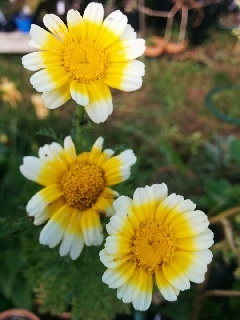 Chrysanthemum coronarium), also known as Shungiku, or chop-suey greens. Feverfew is known as the headache herb, and its efficacy has been scientifically proven to bring relief in particular to those suffering from migraines. Herbal teas and extracts are normally made from the dried leaf, which can be eaten fresh too, but sometimes the whole top flowering part of the plant is used to make a medicine. Historically it was used to treat fevers (FEVERfew), and can also be useful in cases of rheumatoid arthritis, tinnitus and stomach or toothaches. It has a strong and quite distinct scent which some people do not like, but with its feathery leaves and beautiful profusion of white daisy-like flowers, it is a really pretty addition to the herb or cottage garden and worth growing even if you don’t use it as a medicine or insect-repelling plant. Feverfew is really easy to grow – too easy some would say as it can quickly take over a whole garden if left to self-seed. The seedlings are quite easy to spot though and can be pulled up from where you don’t want them growing. I make sure that I only leave one or two flower stems to set seed, and have not had it become a pest in my garden yet. Sow the seeds directly, or in punnets, in early spring. Don’t cover the seeds as they need light to germinate, but keep the soil evenly moist until the new plants emerge. The plant is not too fussy about soil, although they fare best in a good well-draining loam, and they flower most spectacularly in a sunny position. They don’t grow well indoors, but are good specimens for pots on the patio. Feverfew is a perennial, and can be cut back in autumn if you find it is looking straggly and unkempt. The new shoots will come out early in spring, and before long you’ll have beautiful rounded feathery green leaves and multitudes of happy flowers. Add 1 cup (250ml) of boiling water (or rather just boiled water) onto 1 Tbsp of dried feverfew leaves. Steep for up to 30 minutes with a saucer over the cup to “catch and condensate” the steam from the tea. If you don’t like the taste, add 1 part each of chamomile flowers and lemon balm leaves – they also help to reduce the pain, and make you feel relaxed and calm. The simplicity (and complexity!) of the white daisy flowers with their conical yellow centers and the fresh apple-like scent the leaves and flowers have is just wonderful! Never mind the plethora of gentle medicinal actions that are hidden in there! An often used herb to induce calm and quiet, relieve stress and help with sleeplessness, it is also good for easing digestive discomfort, especially griping and colic. It is soothing and relaxing, gentle enough for even babies and young children to use. Besides all of that, it is also very rich in anti-oxidants, and has analgesic, anti-inflammatory, anti-cancer, antiviral, nervine and sedative properties. It is in particular German chamomile that is used medicinally, although commercial teas often sees a mixture of German (annual) and Roman (perennial) flowers. German chamomile is annual, and taller growing than the perennial Roman chamomile, flowering from late spring through summer. Roman chamomile is mat-forming rather than the bushy/shrubby German chamomile with flowering spikes growing to about 15cm only while the main plant remains a rosette of leaves on ground-level. I have found Roman chamomile to flower just a few weeks after German chamomile starts blooming. Although you can easily mow your Roman chamomile to form a lawn, there is another non-flowering Roman chamomile cultivar (it can only be propagated via divisions) that is named Trenegue that is a true carpet chamomile – very low growing (I’ve never had it higher than 5cm), spreading through runners and forming a lovely scented lawn alternative. 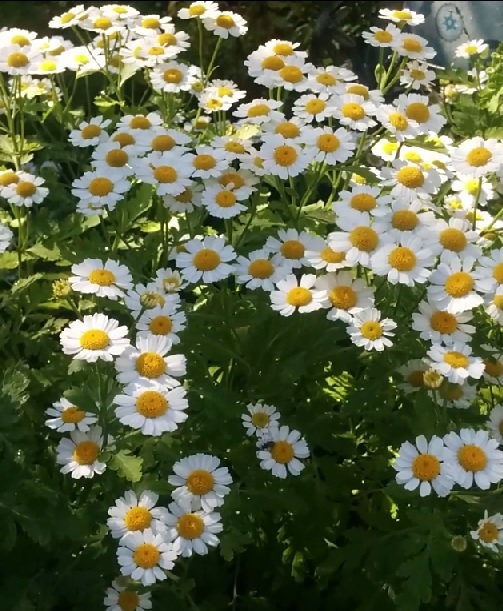 German chamomile is easily started from seed – sprinkle them directly on the ground where you’d like them to grow in the garden, or start them in punnets. Cover the seed only very loosely, and keep moist until they germinate (about 14 days). Transplant when young so that they can establish themselves before flowering toward the end of spring. 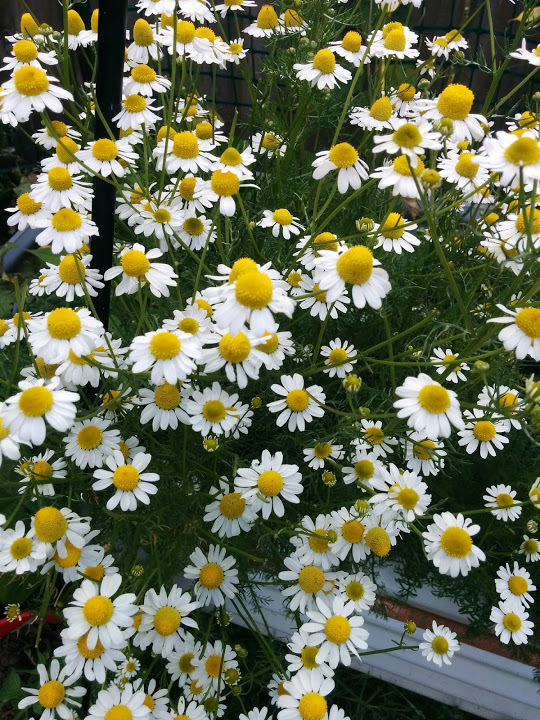 Most chamomile can grow in full sun to part shade, with more aromatics released when grown in a sunny spot. They prefer a well-drained soil, but is not to fussy about how rich or poor the soil is. Chamomile makes a fantastic companion plant in the garden – being a plant’s physician – helping ailing plants to recover and grow at their best. It is also very attractive to beneficial insects and makes a great addition to the vegetable garden. Dried chamomile flowers have the best flavour – and don’t worry about picking your flowers as the season progresses, the more you pick, the more it flowers! As with the feverfew tea, you can add other flavoured herbs – lemon balm and catnip have soothing and calming effects too, so can be added to a relaxing blend, while mint will refresh and invigorate. Add a cup of water to 1 Tbsp of dried chamomile flowers and steep for at least 5 minutes. Drink with or without honey and milk. Relax and enjoy. Oh! The pretty yellow and orange faces of Calendulas make me feel really happy in the garden! They are just so fun and uplifting! These common, and often undervalued flowers, are a must in any herb or vegetable garden in my opinion! Not only are the flowers edible, but they are highly medicinal too (and a good companion in the vegetable garden too). Calendula is a wonderful skin-healing herb, often added to baths, washes, salves, and balms, lip ointments, hair rinses and herb creams. It is anti-inflammatory, anti-microbial, antiseptic, astringent, and antispasmodic. As a gargle, it is soothing and healing to mouth ulcers, inflamed gums, or any inflammation in the mouth or throat. It is used as a skin healing agent for inflamed skin, itchiness, scratches, insect bites and scrapes, burns, eczema and psoriasis, diaper rash, raw and sore skin, sore or cracked lips and almost any other skin ailment. It is soothing and gentle with almost no ill side effects ever recorded. A tea can be used as a hair rinse, and (weak solution) to wash impurities from eyes. Internally the flower petals are added to teas for gut healing, and to help with duodenal ulcers and other intestinal tract issues. The flowers are also a source of household dye, and can be used to colour cloth and foodstuff, like cheese! Even chickens fed with calendula petals are said to lay eggs with a very dark yellow yolk! It is a good companion plant, reducing insect pests, and attracting pollinators. It is also a good compost plant – sometimes included in compost activator recipes. Although they are most often grown as annuals, they can, under ideal circumstances, grow almost through all the seasons, and because they often self-seed when well-sited, they almost seem like perennials. 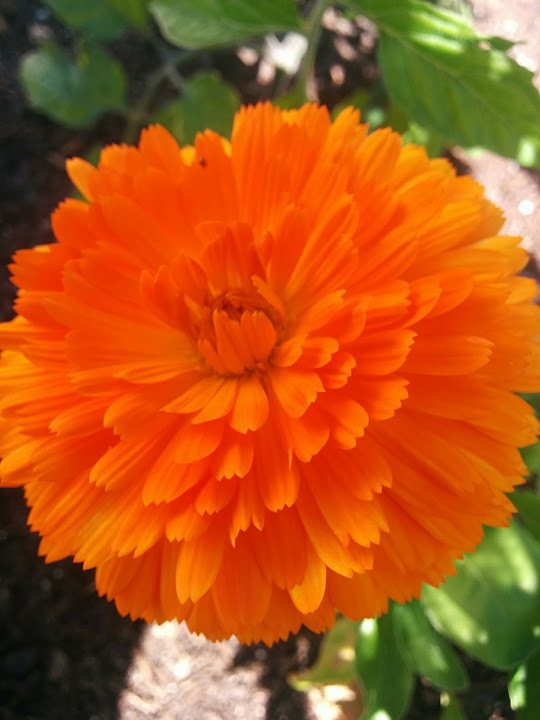 Left to flower and go to seed, you should have a constant supply of calendula flowers almost year-round in a sub-tropical climate. Calendula does best in a loamy soil that is well-draining, but often flowering best in a slighly poorer soil. They prefer a full sun or partial sunny position. Seeds can be sown in early spring directly or in punnets for later transplanting. Sow seeds every few weeks to have a continual supply of new calendula plants. They require dark to germinate, so cover the seeds with seedling medium and keep moist until they have germinated. They may suffer from powdery mildew in hot and humid summers. 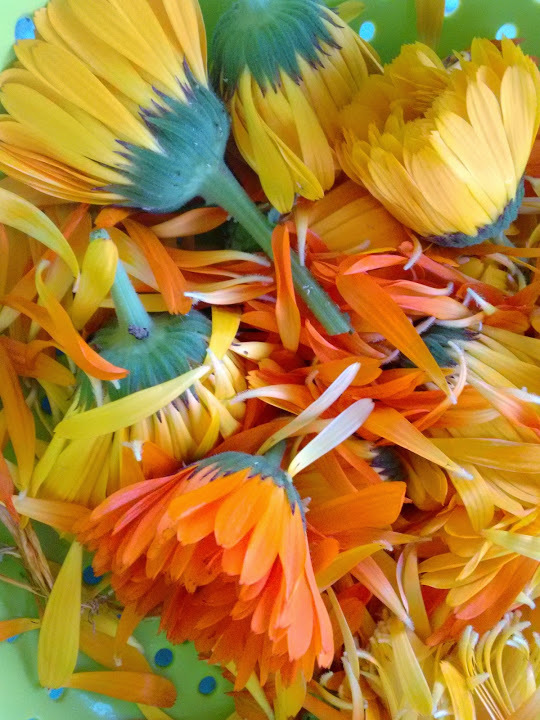 Calendula is often infused in oil such as olive, coconut or almond for a couple of weeks to extract the benefits from the petals into the oil before it is then used in making balms and salves. To make a herb infused oil (macerated oil), pack as many calendula petals into a wide-necked screw top glass jar as you can, and top up with your chosen oil, being careful to cover all plant material, and allow air bubbles to escape. Leave on a sunny (but not too hot) windowsill and give it a gentle shake or swirl daily for at least two weeks. After your 14 days are up, you can strain the herb from the oil and use the oil either directly as a massage oil, bath oil or as a base for skincare products. While calendula (above) may be known as pot marigold, or English marigold, members of the Tagetes genus are known as garden marigold, or common marigold, and while not actually poisonous, they are not quite as tasty or good for you in food, as calendula. See why it’s important to know the Latin name of some plants – especially if your’e going to use them as food or medicines?! 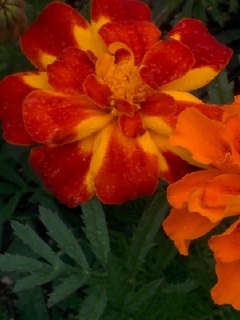 Marigolds are often grown as companion plants in vegetable gardens to repel insects with their strong scent, and in the case of French marigolds, also to repel root nematodes from the soil. Apparently this works best if the plant is actually dug into the soil for the next growing season. There’s two main species of marigolds that are sold as garden plants – French marigold (Tagetes patula), and the somewhat taller African marigold (Tagetes erecta), and hybridization between marigolds have created an amazing selection of sizes, shapes and colours of flowers to choose from – including large pom-pom heads of French Vanilla marigolds and rosy-pink and dusky-oranges in Strawberry Blonde cultivars. Besides the common marigolds, I grow a few special ones too – starfire marigold (Tagetes tenuifolia) which make rounded bushy plants with diminutive flowers in variations of yellow, orange and red. These are very pretty to grow, and as far as marigold flowers go, quite pleasing to eat too (I find the flavour of some of the French and African marigolds a bit unpleasant). Then I also grow Tagetes lemonii, or Mexican Marigold or Lemon’s Marigold, which has a strong passionfruit scent, and another, Tagetes lucida, or Mexican Tarragon, which has a strong aniseed fragrance and taste, very much like tarragon. The name Tagetes apparently comes from the Etruscan myth of Tages who sprang up from plowed earth, apparently referring to how easy this plant is to grow, springing forth each year from seeds left in the ground from the previous season. Unfortunately this does not ring true for me, even if I scatter what seems like half a kilogram of seeds on the soil. I have a tremendous battle with slugs and snails on my marigold seedlings, and if I don’t raise them somewhere protected until they are near fully grown, I can almost be assured of a marigold massacre… Once they are established however, they do seem to do quite well in the garden, and I love interplanting them with my vegetables – like potato, peppers, aubergine and tomatoes. I have learnt not to companion plant them with beans and cabbages, as they are said to be particularly unliked by leguminous plants. Seeds need about 14-21 days to germinate, and need to be protected from slugs and snails. They love a hot and full sun position, and are not too fussy about soil, although a well-drained loam, as you’d find in a vegetable plot, would be great, and produce an abundance of flowers. Somewhat drought tolerant. Chop-suey greens, or edible chrysanthemum (Glebionis coronaria) was a brand new one for me only a couple of years ago, but now has a prominent place in my garden. 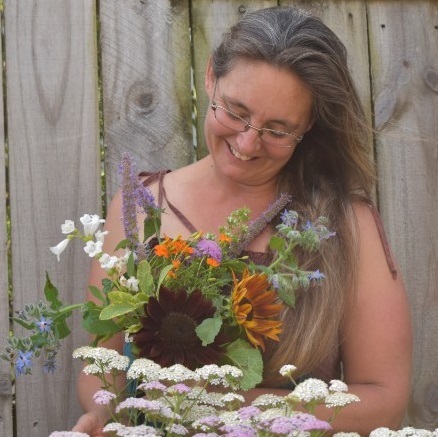 Not only are the flowers very attractive (like large daisies), but the leaves are fabulously flavoursome, and a delicious addition to my edible greens. The mineral and vitamin rich young shoots and stems can be eaten raw or cooked and are strongly aromatic. Often used in Asian cuisine, especially in Cantonese and Hong Kong hotpots, Taiwanese oyster omelettes, and stirfry as well as Korean cookery and Japanese nabemono. To avoid overcooking, it is often added at the last minute. I hope you’ve enjoyed this week’s walk through my garden. See you back next week for more Five at 5. 1. I do not run affiliate programs, if I mention a product or a nursery in my posts, it is without monetary or any other incentive from them to do so, and because I either believe in their product, or it was the only place to get what I needed. 2. I am proud to say that my daughter has edited all the video! Go PrincessDestinyJewel10!